What pilot facilities are available at the main terminal? What aircraft services are available? What other aircraft facilities are available on the field? What are the general requirements for aircraft rental? What aircraft are available for rental? What are the requirements for each type of aircraft? What are the minimum (hourly) requirements? When is payment due for aircraft rental? Where is the flight school located? How many instructors are on staff? Do you offer an introductory (Discovery) flight? How much does the introductory (Discovery) flight cost? How do I schedule an introductory (Discovery) flight? How do I get started with flying lessons? Is a Private Pilot Ground School Class available at West Houston? When? What types of aircraft are used in the flight training? How long should it take to receive a Private Pilot's License? How much will it cost to receive a Private Pilot's License? Is there a written exam required for a Private Pilot's license? What other aeronautical ratings are offered at West Houston? Q: Where is the airport located? West Houston Airport is located 15 miles west of Houston, Texas, just north of Interstate 10, between Highway 6 and Barker Cypress. See maps. Airport operations, including runways, taxiways, terminal facilities, full service fuel, and hangar services, are available 24 hours a day, 365 days a year. Q: What pilot facilities are available at the main terminal? Q: What aircraft services are available? Q: What other aircraft facilities are available on the field? Q: Are courtesy cars available? Yes. West Houston maintains a fleet of courtesy vehicles for airport customers. These vehicles are available on a first-come-first-serve basis, with a 2-3 hour limit. Current valid driver's license and major credit card required for proof of financial responsibility. Q: Are rental cars available? Yes. Compact, mid-size, and luxury rental cars are available at the main terminal for airport customers. Reservations can be made by contacting West Houston Customer Service at 281-492-2130. Current valid driver's license and major credit card required. Q: What are the general requirements for aircraft rental? * Special Requirements since 9/11 must be met for flight training. Q: What aircraft are available for rental? The full flight school fleet listing can be viewed at Aircraft Rental. Q: What are the requirements for each type of aircraft? The rental requirements for each aircraft can be found at Aircraft Rental. Q: What are the minimum (hourly) requirements? The minimum rental requirements are one-half hour minimum rental per flight, and three hour minimum rental per 24 hours that the aircraft is kept. Q: When is payment due for aircraft rental? Flights completed within the same day require payment at the end of each flight. On flights exceeding 24 hours, a deposit for the full estimated time is due at the time of reservation. Q: Where is the flight school located? The flight school is located within the main terminal of West Houston Airport. Flight and weather briefings as well as aircraft dispatching is completed on the ground floor, while individual and classroom instruction takes place on the second floor. Q: How many instructors are on staff? 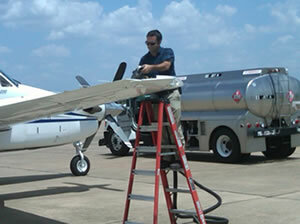 West Houston Flight School maintains an adequate number of flight instructors on its staff, including Chief Pilot C.G. "Hank" Henry. Q: Do you offer an introductory (Discovery) flight? Yes. West Houston's Introductory or "Discovery" flight begins with a viewing of the 30 minute video "So You Want To Learn How To Fly." The student pilot, together with an FAA approved, professional flight instructor will then complete a comprehensive "preflight" inspection of the aircraft (a new Model Cessna 172S), and then take to the skies for a 30 minute flight in the local area. During this flight, the student pilot will actually operate the controls and fly the plane. The flight will be followed by a post flight "debriefing" and completion of the first entry in the student pilot's logbook. This flight is the first half-hour of required dual flight instruction toward the Private Pilot's License. Q: How much does the introductory (Discovery) flight cost? The cost of the "Discovery Flight" is $99.00, including all charges, taxes, and fees. Q: How do I schedule an introductory (Discovery) flight? The "Discovery" flight can be scheduled any day of the week from 8:00 am to 8:00 pm by contacting a Customer Service Representative at 281-492-2130. Typically, one hour of time will be allocated to the pilot and aircraft. It is recommended to arrive 45-60 minutes prior to the flight to watch the video, meet the instructor pilot, and become familiar with the flight school procedures. Discovery flights are best taken during most of the seasons early in the mornings due to the probability of smoother air and cooler temperatures. Q: How do I get started with flying lessons? The "Discovery Flight" described above is a great way to get started. Following that flight, lessons can be scheduled in person or by calling our Customer Service Desk at 281-492-2130. Flight and ground instruction is available seven days a week and is limited only by the scheduling of the student pilot, instructor pilot and aircraft. When scheduling a flight lesson, the typical time blocked is for two hours, which provides enough time to meet with the instructor, preflight the aircraft, complete a 1 to 1.5 hour flight lesson, secure the aircraft, and debrief with the instructor. Q: Is ground school required? No, a formal classroom-type ground school is not required, however, the open discussions and interaction with other students is often a very beneficial supplement to individual instructor and book learning. Such a class is designed to help the student prepare for the knowledge based skills needed in his flight training as well as the FAA written exam. Q: Is a Private Pilot Ground School Class available at West Houston? When? The Private Pilot Ground School is taught every Monday night from 7:00 pm to 10:00 pm at the main terminal. The full class is twelve weeks long and while it may be desirable to begin the series of classes at the beginning, each class can be taken individually for review or clarification of a specific topic. For more information, see Private Pilot Ground School. Q: What types of aircraft are used in the flight training? West Houston Flight School provides primary flight training in Cessna 172S. To view the entire fleet, see Aircraft Rental. Q: How long should it take to receive a Private Pilot's License? The time required to obtain a private pilot's license depends greatly on variables such as frequency of flight, previous aviation experience, speed of learning, and weather. Typically, flying 2-3 times per week, one hour per lesson, combined with occasional unplanned delays, and days off for ground training might take 4-6 months from start to license. Again, these times are general and your training time may be more or less. Q: How much will it cost to receive a Private Pilot's License? The cost for obtaining your private pilot's license can vary greatly, depending on many variables. These include the type of plane chosen to fly, previous experience in aviation, and the student's ability to learn and master the required skills. Other less predictable variables include weather and/or scheduling conflicts. In general, a private pilot's license is going to require an average of 45-55 hours of flight time, with 25-35 of that being dual time with a flight instructor, and the balance being solo time. A very general ESTIMATE might result in costs ranging from $7,000 to $9,000; however, the final total may be more or less. Q: Is payment required in advance? No, payment is not required in advance. Payment can be made flight by flight, by means of cash, check, or major credit card. For convenience and speed in processing, deposits for any amount can be applied to an account and the account debited upon completion of each lesson. Q: Is there a written exam required for a Private Pilot's License? Yes, successful completion of an FAA written exam is required prior to taking the final check ride. The West Houston Ground School class helps prepare for this exam, as does many other text books and study guides which are also available at West Houston Airport. The exam is taken electronically though any FAA approved testing center. Q: What other aeronautical ratings are offered at West Houston? Flight instruction at West Houston includes training for the Private Pilot, Instrument Rating, Commercial Pilot, Multi-Engine Rating, Certified Flight Instructor (CFI), Certified Instrument Flight Instructor (CFII), and Airline Transport Pilot.